As you probably know, I had the amazing chance to visit Hua Hin in Thailand earlier on this year. It was my first ever holiday abroad and I am so glad we chose to visit Thailand. Luckily we didn't have to look around for a hotel for somewhere to stay because my partners parents have a house there, as they visit Thailand for 3 weeks every 3 months (amazing eh?!). We are hoping to join them again in 2017. Which then gives us more time to save up and be able to do more things we weren't able to do whilst we were there February this year. I would love to try out more of their foods and I must admit I really miss my usual foods I ate there. I've bought Thai food from a takeaway before and it's nothing like what it was in Thailand. Next time we visit I will be sure to try out a lot more than what I did first time round. Although the girls really enjoyed themselves earlier this year, it think they will enjoy it a lot more when they are older. In 2017 Mia will be 7 and Elliw will be (nearly) 5. Maybe at Mia's age she will remember more about the holiday too. Me and my partner may hire our own car next time we visit so we can spend time on our own with the kids too. Don't get me wrong, it was lovely and amazing spending so much time with his parents. We really did enjoy it but I felt guilty and sorry for them that they had to be stuck with us through the whole time and Elliw going through her tantrum stages and not behaving very well when we went out for food. So it would be nice to have our own car and we can all go different places, experience more and do more things. I found Hua Hin really affordable. The prices were a lot cheaper than the UK. We sometimes bought food on the side of the streets which was really cheap and tasted lovely. Of course, some shops were more expensive or around the same price as us but most of their things were very affordable. 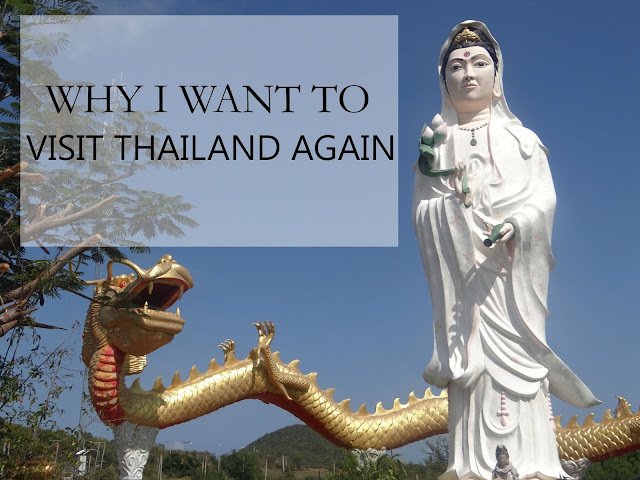 One of the main things I really enjoyed about visiting Thailand the first time was I could forget about everything at home. I didn't have to worry about bills, money or anything else that was going on. It was just a lovely place to relax. Although Thai people are very hard workers, they are also very laid back and chilled out, which is what I love. Again, with the girls being older by the next time we visit I think we can relax a little bit more. Have you ever visit Thailand? I feel exactly the same about Thailand. It is the last holiday me and my husband had before we had children and it was absolutely amazing...loved every part of it and would love to go back! Thailand is a lovely country, and you are right, people there are so smiley and relaxed. I went a few years ago with my husband - prekids. Now he really wants to go back for longer, as his friend has been living in Chiang Mai for a few years and keeps on inviting us. You should come back, and maybe check out one of the islands. Koh Chang or Koh Samed are quite close to Bangkok if you don't want to have any internal flights but the most beautiful beaches are in the South. There are lots of fun things for families to do in Chiang Mai too. wow what an amazing place to visit .. its on my list to visit .. although not sure when we will get round to it! Wow, I just come across your blog. As a Thai people, I really appreciated your article about Thailand. Big thank and big hug from super sunshine land.